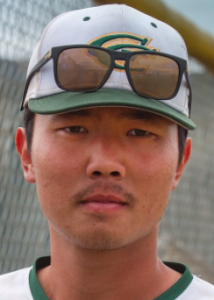 EL CAJON (4-18-2017) – On one of the state’s most potent offenses, Grossmont College freshman outfielder JALE SIM has had his opportunities somewhat limited on such a talented roster. Sim, from Scripps Ranch High, may have seen his share of time cut into his effectiveness in finding a steady lineup spot that might have enabled him to contribute more behind the Griffins’ dynamic sophomore outfield trio. But on Tuesday, head coach RANDY ABSHIER gave Sim a start as the designated hitter in the lucrative No. 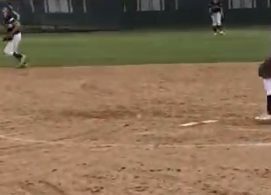 6 hole behind Grossmont’s top sluggers in the biggest game of the season to-date, and he responded with a two-run home run in the second inning as the Griffins pounded Palomar, 11-3, at Noel Mickelsen Field. The home run to right field, Sim’s second of the season, followed a solo blast by ROBERT BOSTEDT as Grossmont once again spotted an opponent a 1st inning lead, but came with a three-run second, then another three-spot in the third. 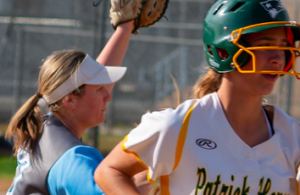 Grossmont, the state’s 11th-ranked team, took a one-game lead over Palomar with the win in the first of a three-game home-away-home series this week, which will decide the Pacific Coast Athletic Conference title. The Griffins improved to 18-1 in the conference with five games left and 25-6-1 overall. Grossmont has now won 10 straight and has lost just once in its last 24 contests. 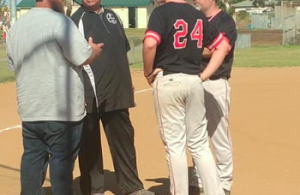 Palomar, who were ranked sixth in the latest state poll, saw its 14-game winning snapped and fell to 17-2 PCAC, 27-7 overall. The next game will be played on Thursday at at Palomar College Ballpark at noon. 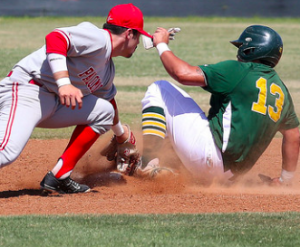 The final game of the series will be played at Grossmont on Saturday, also at noon. 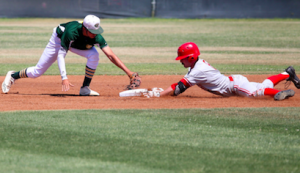 On Tuesday, Grossmont freshman REECE HERNANDEZ (Santana) singled home a run in the hosts’ three-run third, then sophomore JUSTEN BURKEY drove in a pair of runs with a single to center. 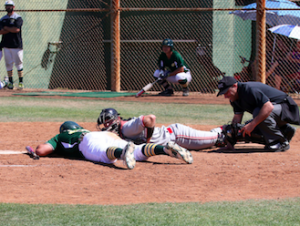 Palomar rallied to close the gap to 6-3, scoring twice in the top of the seventh on a single by Tristan King, Marco Young’s sacrifice bunt and back-to-back singles by Joey Cooper and Jordan Gardner, the latter to drive in both runs. Grossmont freshman TIM HOLDGRAFER (6-0) was very effective in limiting the Comets, until they knocked him from the game with the rally. Freshman HAYDEN SHENEFIELD came on to get the final two outs of the frame, then delivered a scoreless eighth despite allowing a pair of hits, getting out of the jam with his quick reaction on a line-out 1-3 double play. The Comets’ come-from-behind hopes unraveled in the bottom of the seventh inning. That’s when the Griffins scored 4 times on 2 errors on a play when a pitcher made a bad throw to second instead of going to first on Hernandez’s sacrifice bunt – coupled with 4 walks in the inning. Sophomore NOAH STROHL singled down the right field line to drive in Hernandez and sophomore TREVOR BEARD singled to center to drive in two more, as Grossmont led 10-3 after seven. Burkey added a third RBI in the bottom of the eighth when he was hit by a pitch with the bases loaded. Palomar’s 14-game win streak was the second-longest in California this season. The state’s longest streak of 25 games also ended Tuesday when No. 1-ranked El Camino lost 3-2 to Rio Hondo. G. Buck singled to left center, RBI; J. Gardner scored. J. Sim homered to right field, 2 RBI; J. Burkey scored. R. Hernandez singled to left center, RBI; D. Maldonado scored. J. Burkey singled up the middle, 2 RBI; R. Bostedt scored; N. Strohl scored. J. Cooper advanced to third, failed pickoff attempt; T. King scored on a throwing error by p, failed pickoff attempt. J. Gardner singled to right field, RBI; J. Cooper scored. R. Hernandez reached on a fielder’s choice to pitcher, advanced to second; D. Maldonado advanced to second on a throwing error by c, advanced to third, scored on a throwing error by cf. N. Strohl singled down the rf line, out at second rf to 1b to ss, RBI; R. Hernandez scored. T. Beard singled to center field, 2 RBI; M. Diffley advanced to second; S. Crosby scored; J. Burkey scored. J. Burkey hit by pitch, RBI; E. la advanced to second; N. Strohl advanced to third; D. Maldonado scored.